Towing anything, be it a caravan, a boat or anything else might seem quite simple, but the truth is that it requires some knowledge and forward thinking. The owner of the Jeep Wrangler in the video might lack those two – or something else, which is not obvious to us, might have caused them to swerve and end up like this. 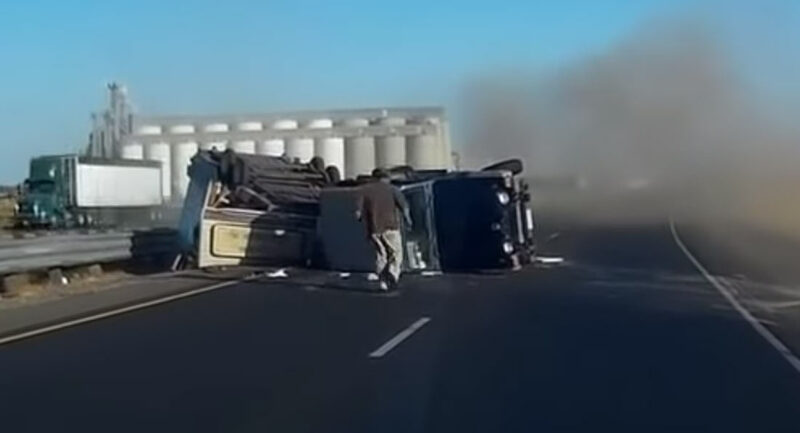 While recently driving onto southbound Highway 99 in Madera, California, a YouTube user came across a blue Wrangler towing a large caravan onto the highway. For the first few seconds, everything appears quite benign. However, as the Wrangler accelerates on to the highway, the trailer starts to violently swing left and right, and eventually they both tip over, forcing other motorists to brake hard in order to avoid crashing into them. Fortunately, they all came to an emergency stop in time, and a number of drivers rushed to see if the driver was okay. He was and, reportedly, only suffered a scratch to the head and a mild concussion. Towing is not as easy as one might think, as the vehicle behaves in a different manner – and that might catch some drivers unawares. Thus, if you intend to do it, especially for the first time, do some research about your preferred tow vehicle, what you intend on towing, and how to best load and attach anything that’s being towed, and could save yourself a lot of heartache – and, if you’re lucky, a concussion. Jeeps have much to short or a wheelbase to be towing something that heavy without added anti-sway systems. Not enough tongue weight. Do your homework before you leave the house. That vintage of Jeep has a towing capacity of 2000 lbs., AFAIK, not because of power, but because of wheelbase. A larger, heavier trailer takes over and does exactly what this video showed. I would be shocked if that trailer was under 2k lbs. Also, never let a munchkin behind the wheel! Simple. Something that short is not a tow vehicle when something of that size is attached to it. Classic trailer weight balance problem. the Tongue side of the trailer was lighter than the rear end. Plus the short wheel base did not help. Trailer is likely to big for this jeep wrangler. My jeep grand cherokee would handle this trailer quite nicely. Don’t know if the trailer had e-brakes. If so, it might have helped stop the oscillation. Don’t load too much in the trailer on the rear end. put this stuff up front to get it on the tonque/hitch.